Remain and Leave were neck-and-neck for the last few hours but Leave is now pulling ahead by 4%. London and Scotland vote counts show huge support for Remain. But the pound crashes after a wide-ranging number of places overwhelmingly back Brexit. ITV News is now predicting 75% chance of Brexit. An estimated 46,499,537 people were entitled to take part in the vote. YouGov poll shows 52-48 split in favour of Remain. Ipsos Mori poll gives Remain 54-46 lead. Terrible weather across some parts of Britain, particularly in London and the South East, may have affected turnout. Despite inclement weather, overall turnout is expected to be very high. This blog is being continually updated. Refresh this page, or click here for updates. 90 of 382 local authorities still to declare votes. Leave on 52% and Remain on 48%. Leave are “undoubtedly the favourite,” he added. The leader of the UK Independence Party — Nigel Farage — is declaring victory for Leave after previously declaring a defeat. 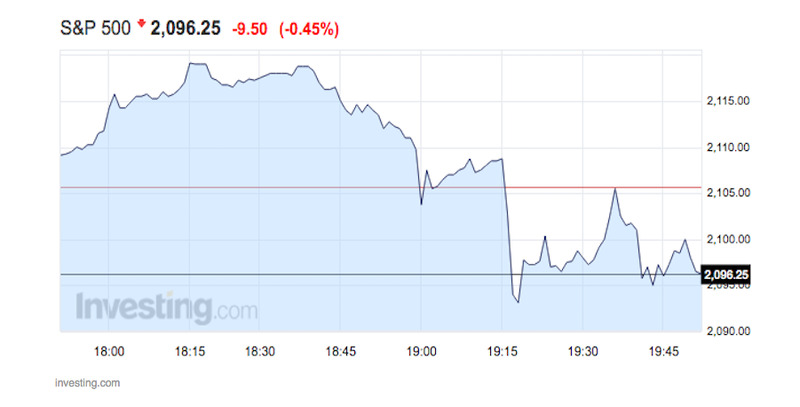 The London-based bank HSBC, which has a huge amount of business in Asia, is seeing shares crash in HK. This could signal some severe weakness in the FTSE 100 when the London market opens at 8 a.m. BST. The super affluent borough of London — Kensington and Chelsea — is massively for Remain. 165 of 382 local authorities are still to declare votes but Leave is still ahead with 52%, with 8,544,442 votes. Remain is on 48%, with 8,042,118 votes. It was neck-and-neck for the last hour or so, but now Leave are ahead with 52% and by over half a million votes. Remain is on 48%. 188 of 382 local authorities are still to declare counts. HSBC shares, trading in Hong Kong, are being absolutely smashed as Brexit fears weigh on investors. While HSBC does a lot of its business in Asia, it is headquartered in London. HSBC has said several times that it would consider leaving the UK if there was a Brexit. The Asia trading session is a worrying indication of how HSBC shares will react when the London trading session opens at 8 a.m. BST. 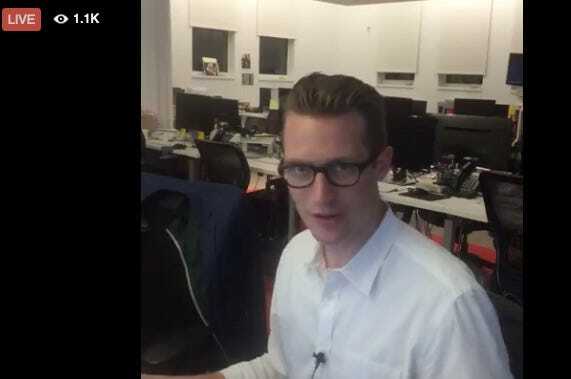 US markets reporter Myles Udland is talking on Facebook Live about how the massive sterling swings “is what you see in emerging market currencies.” Basically, emerging markets have usually a lot more volatility and therefore can rise and fall quickly. Join us on Facebook right now for Myles’ take on how the markets are reacting to the results so far. There is absolutely NO clear winner at this stage with 268, out of 382, local authorities to declare their counts. Currently, Remain is on 49.7% and Leave is on 50.3%. Isle of Wight, the largest and second most populous island in England, has spoken — it’s a resounding “Leave” vote. 75% of voters in Wandsworth also pipped for Remain (118,463) versus Leave at 25% (39,421). Remain is in the lead, but only just, with 51% and 2,462,642 votes. Lead is on 49% and 2,377,506 votes. 310 local authorities are still to declare and it looks like it could swing either way. The latest tally puts leave ahead with 53% with 1,396,247 votes versus Remain’s 47% with 1,250,080 votes. In other words, these places could really indicate whether it’s going to be a Brexit or not. Lindsay Lohan is following the referendum pretty intently right now, tweeting frantically about what is happening on a pretty much count-by-count basis. Lohan moved to London with her Russian billionaire fiance – and is passionately tweeting in support of the “Remain” camp. Essex area Basildon has voted strongly to leave the EU, with 67,251 votes for out, compared to 30,748 for remain. Big cheer at the #brexitparty as Basildon votes more than two to one out. Chants here of Basildon, Basildon, Basildon. In other Leave news, Hartlepool in north east England voted 70-30 to leave EU. The area had been expected to vote out, but not by such a large margin. Salford in Greater Manchester, an area identified by HSBC as one of the “key” voting areas is expected imminently. The count from Salford was pencilled in for 1.30 a.m. The way Salford swings could be a very important indicator of the national outcome. Turnout is expected to be high. Samuel Tombs, the chief UK economist for Pantheon Macroeconomics has tweeted to suggest that turnouts in London are a little lower than the national average. Maybe all that rain did have an impact on the amount of people able to vote. Turnout in Richmond upon Thames in South London has a turnout of more than 82%, it is reported. The latest result to come in is from Swindon in Wiltshire where voters have backed Leave by 55% to 45%. This result was pretty much in line with the expectations of polling analysts. In total, 61,745 people voted Leave, 51,220 to Remain. Foyle in Northern Ireland, a strong nationalist area, has overwhelmingly voted to remain in the European Union. Voters in the area backed remain by 78%-22%. Turnout was relatively low however, just 57% of those eligible voted. “This is a strong result for Remain but of course being a nationalist part of the province we would expect Remain to do better there than in the province as a whole – where overall we’re anticipating something like a 60% vote for Remain,” John Curtice told the BBC. In the Isles of Scilly, Remain prevailed. The Isles are the smallest counting area in the referendum. 0046 — WILL IT BE LONDON VS THE REST OF THE UK? The BBC’s political editor Laura Kuenssberg suggests that there could be a huge divide between London and the rest of England. Hear Remain might be as high as 83% in Lewisham – we going to see London v the rest of the country? As Business Insider’s Adam Payne recently noted, the northwest city of Lancaster could give us a massive clue about the final result hours before the official declaration. Lancaster will not be declaring for a while though, the result is expected at around 3.30 a.m. The pound is plummeting as Sunderland votes heavily for Leave. Markets are very nervy at the moment as the polls — and the markets – could be wrong. The Sunderland result has definitely altered the tone of the evening and markets are getting very choppy,” Joe Rundle of City trading firm ETX Capital commented. The Scottish region of Orkney has also declared, with 63% of voters, around 7,500 ballots, voting to stay in the EU. 37% of voters backed Brexit. The BBC is reporting that the votes in Newcastle and Sunderland don’t look great for Remain. A marginal victory is now expected for Remain in Newcastle, when earlier predictions suggested as much as a 60-40 split. Sunderland could vote more than 60% for Leave. Both results would be a big hit for the Remain camp. Speculation of weak results for remain in both Sunderland and Newcastle. Not looking as simple as those 10pm 93% betting odds suggested. Betting odds are moving substantially as a result. Betting odds moving considerably in last few moments, on Sunderland result. 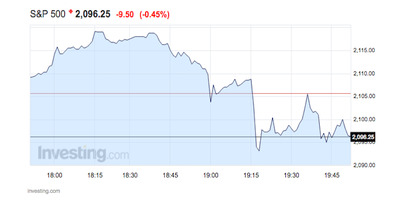 I’ve put a short on the FTSE100. “Gold is being slammed in early Asian trade on Friday, continuing to unwind as investors dump the perceived safe haven as fears over a Brexit continue to subside. Voters in Gibraltar have, as expected, voted overwhelmingly to remain in the European Union. Voters on the island off the Spanish coast voted 96%-4% to stay, with 19,322 people backing Remain, and just 823 voting to leave the EU. Volunteers counting votes in Kirklees in Yorkshire held a moment of silence for MP Jo Cox, who was killed last week after being shot and stabbed in her constituency, Batley and Spen. Thomas Mair, the man suspected of Cox’s murder is set to face trial in November. Mair, 52, is accused of shooting and stabbing Cox, a 41-year-old mother of two young children, in the street as she arrived for a meeting with residents in the town of Birstall. 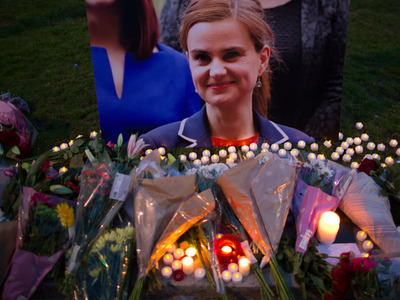 Dan Kitwood/Getty ImagesFlowers surround a picture of Jo Cox during a vigil in Parliament Square on June 16, 2016 in London, United Kingdom. Reports are that turnout in Kettering, Northamptonshire is around 76%, compared to 67% during the general election last year. There are also reports that turnouts in the City of London, and Westminster are over 80%. Between 9 p.m. and 9.30 p.m. the pound was more active in terms of trading than at any other period so far in 2016, the BBC’s economics editor Kamal Ahmed reports. The pound has jumped since polls closed, and after a YouGov poll gave Remain a 52-48 lead over the Leave campaign. Counting has now begun, and two counts in the North East of England are battling it out to be the first to declare their results. Traditionally, Sunderland is the first place to declare in national elections, but it is facing competition from Newcastle upon Tyne, just 15 miles down the road. Newcastle has reportedly hired swathes of students to try and beat its regional rivals to the count. “This gives us a mid-point prediction of an 8.5% lead for remain, or a majority of around 2.5 million of votes cast. But don’t be surprised if the gap is less than one million — or as much as four million. And if the phone polls have been systematically overstating support for Remain throughout the campaign, then a victory for Brexit is perfectly possible. Sterling jumped on the announcement of YouGov’s poll, climbing to another year-to-date high against the dollar, approaching $1.50. Britain’s currency took something of a rollercoaster ride on Thursday, but now that Remain seems to have a convincing lead, it is rocketing. YouGov’s much anticipated on the day poll has the Remain campaign ahead by four points over Leave, with a 52-48 split in favour of staying in the European Union. Since there are no exit polls for the referendum, unlike the general election, this is our best gauge of voter sentiment until results start trickling in from local counting areas around 1 a.m. BST. 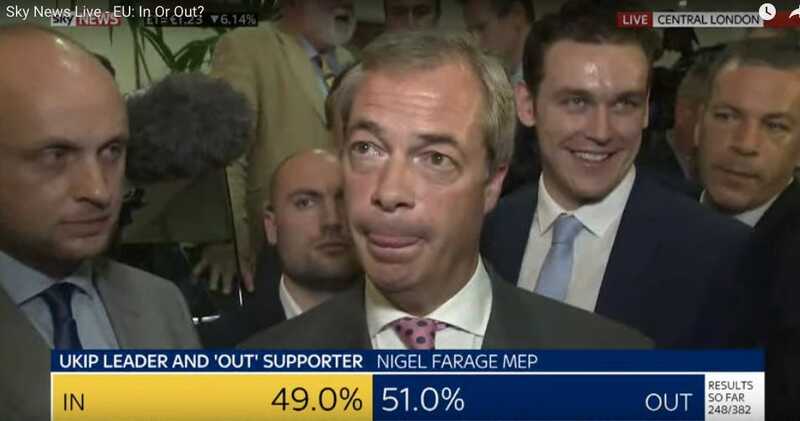 The UKIP leader, and one of the most prominent Leave campaigners, appears to have conceded defeat, telling Sky News’ Darren McCaffrey that he expects Remain to win by a narrow margin. All polls are now shut, although it should be noted that anyone still queuing to vote will be allowed to do so. Now voting is closed, we’re expecting a poll (not an exit poll) from YouGov any minute. It will be at least a couple of hours before the first results start to come in. According to a report from Reuters Buzz editor Eric Burroughs, turnout on the island state, where polls closed at 9 p.m. UK time, was more than 80%. Higher turnouts are expected to favour the Remain campaign. The S&P 500, one of the USA’s key stock indexes, jumped more than 1% on Thursday, as investors celebrated polls that hinted Remain is likely to win the EU referendum. The S&P is now within 1% of all-time highs. Business Insider’s US-based markets correspondent has the full wrap-up of the day’s events. 2141 — HAS BORIS JOHNSON CONCEDED DEFEAT? Boris Johnson, probably the most prominent Leave campaigner, appears to have conceded defeat before the polls have even closed, if this tweet is to be believed. Commuter Lewis Iwu tweeted to say he spoke with Johnson on the London Underground, and the former London mayor apparently admitted he believes the Leave campaign has lost the referendum. Obviously, this one tweet isn’t a decisive indicator of how things may have gone, but it is interesting nonetheless. To provide something of a bellwether of how voting may go, HSBC’s chief UK economist Simon Wells and his team have provided a useful table showing some of the key areas that could help determine whether Britain stays in or leaves the EU. The areas listed are those where public opinion has generally been close to the UK average, meaning that the way these places vote could be a strong indicator of the way the country as a whole goes. The first, Salford is expected at around 1.30 a.m. Welcome to part two of our live coverage of the historic referendum on Britain’s membership in the European Union. Voting started at 7 a.m. BST and ends in half an hour at 10 p.m. BST. Once polls are closed, and reporting restrictions are lifted, we will deliver all developments from the referendum, including any opinion polls as soon as we have them, as well as the actual results as they come in throughout the night and into Friday.